All undergraduate students at BU are eligible to apply, as are recent graduates. Examples of research could be anything from preparing for your dissertation or an essay to work carried out during your placement year to volunteering or work with academic societies. The key criteria is to be able to evidence your own critical thinking through your work. 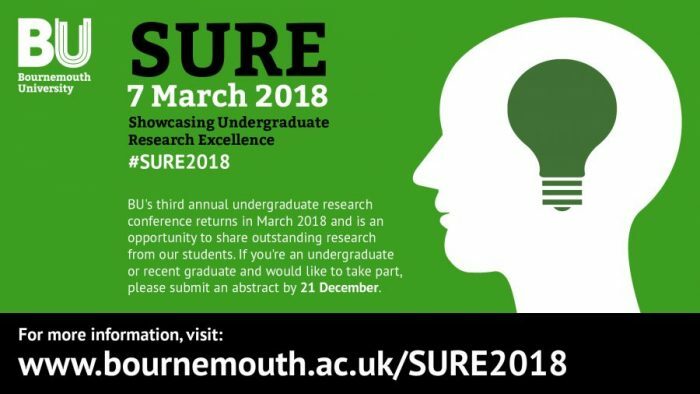 To apply to present at SURE 2018, you’ll need to submit an application form, which includes a 250 word abstract, to sure@bournemouth.ac.uk. Please read our ‘how to apply’ guidance first. Abstracts will be accepted for oral or poster presentations. If you’d like to present your research through another medium – a film, art exhibition or performance – please contact sure@bournemouth.ac.uk initially. The deadline for submitting abstracts is has been extended to 12 January 2018.